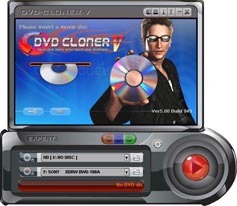 DVD-Cloner-Pro is excellent DVD copy software that makes quality DVD backups easily. The new burning engine can make perfect 1:1 copies. It can intuitively recognize the disc's format and provide the appropriate copy modes and options. The latest version utilizes SmartAnalyser to ensure the highest level of success copying latest DVD movies. Now it supports the backup of Blu-ray / HD DVDs. Buy now and you'll enjoy it! Qweas is providing links to Clone DVD Copy Pro 6.3 as a courtesy, and makes no representations regarding Clone DVD Copy Pro or any other applications or any information related thereto. Any questions, complaints or claims regarding this application Clone DVD Copy Pro 6.3 must be directed to the appropriate software vendor. You may click the publisher link of Clone DVD Copy Pro on the top of this page to get more details about the vendor.